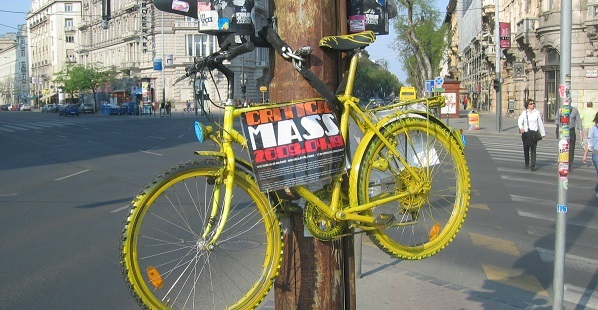 „Critical mass Promotion“ by CMB. Cycling in Vienna is not only a valid way of transportation and a popular form of exercise and sport, but also a highly political topic and subculture. It is springtime 2015 and the race for student council elections has started and as usual the left-winged party GRAS is campaigning with bicycle pop-up stores, where students can get their 2-wheels fixed and ready for the summer. In 2010 when “Die Grünen” the national left-wing party and mother of GRAS were campaigning the cycling-conditions in Vienna and as a result of their win, bicycle lanes all over the city will be painted green for more visibility. There is an ongoing dispute in the city between car-owners (representing the conservatives) and cyclists (representing the liberal parties) all over the city, in which each side feels disadvantaged by the other. If one likes to exaggerate, you could say that choosing your preferred means of transportation in Vienna, is a political statement. Despite the political relevance of the dispute a cycling subculture has emerged in Vienna and all over the world, standing for a more conscious and ecological lifestyle and organizing events and happenings all around the non-motorized transportation. For example the Radkult Festival, which last took place in fall 2014. Since 1996 Vienna takes part in the international critical mass movement with the declared goal to “gain back public space, for the individual.” Though being politically motivated the monthly critical mass ride is rather a get-together and social happening than a form of protest. All different kinds people from all over the city take part and enjoy a traffic free ride amongst hundreds of other bike aficionados proofing that there is a subculture a colorful city like Vienna may not forget in its endeavors. Politically relevant or not, cycling is definitely more than just one way to go from point A to point B and it offers a unique perspective on the city. Maybe as a result of liberal politics or non-violent movements the city is already a place, which embraces the culture of two wheels, so be advised to give it a try. If you haven’t had the time to get your bike ready for the summer season, you can stop by the Do-it-yourself Bike Workshop at the WUK cultural center from Monday to Wednesday afternoon, where you can find professional advice, tools and spare parts to improve your bike for only 4€.